As the Finn dominated, Williams stars Nick Heidfeld and Mark Webber fought through to the podium. It's Webber's first podium and Heidfeld best ever finish. Kudos guys! 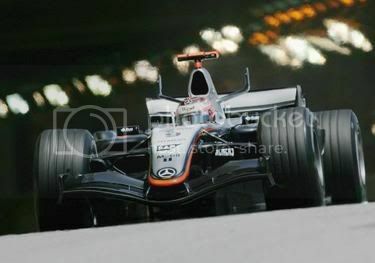 Meanwhile, defending champ Schumi managed a 7th position. A reasonable result I reckon as reds have been struggling all weekend trying to get more pace out of the car. Too bad I didn't watch the race though sigh. Alonso is still in 1st place, cannot believe that. But maybe ferrari will catch up pretty soon. I don't know much about the new season of F1 race, no Astro in my house currently. no point worrying about michael, cause he's out of the championship. you should target alonso, look at the point differences. [applegal] if Kimi can keep his pace, no doubt he'll win the championship. [cccp] i wouldn't write off schumi so early. he's insanely lucky and in the F1 world, anything can happen. No silverware for Man Utd this season! F1: Two in a row for Kimi Wooohooooo. Kimi Raikkonen wins! Kimi had a flawless, almost uneventful race, unlike poor Alonso who had to struggle with his rear tyres, hope he can do better next race :) no point worrying about michael, cause he's out of the championship. you should target alonso, look at the point differences. [applegal] if Kimi can keep his pace, no doubt he'll win the championship. © 2007 my ramblings | expressions :: No part of the content or the blog may be reproduced without prior written permission.